James Wayne grows NuSun sunflowers, a variety that has a good balance of fats and produces a quality oil. It’s like sunshine caught in a bottle, and its nutty taste bursts in the mouth. It’s non GMO, drought tolerant and cold-pressed, chocked full of Vitamin E and healthy fats. Sunflower oil has been the oil of choice in Europe for centuries. James Wayne has grown sunflowers for the last three years on a few acres near Interstate 40 between Little Rock and Lonoke in the Delta’s rich, dark dirt in which plants thrive. Although sunflowers are often associated with the northern tier of states like the Dakotas, Wayne says, “I knew sunflowers would grow well here.” The plant species is native to America and was important to the continent’s pre-European populations. Later, the Spanish took the seeds back to Europe and Russians were the first to hybridize the plant. It gained importance as a row crop in the mid-1950s in North Dakota and Minnesota. While it’s popular as a summer garden ornamental and for its ability to attract honeybees, Wayne may be the only farmer in Arkansas growing the giant flower as a crop. He usually drops the black seeds into the ground in mid-May, with a harvest date of late August. However, this spring’s cooler temperatures and heavier- and later-than-usual rains prevented him from planting his crop, so he’s relying on last year’s seed harvest for this year’s sunflower oil production. While not organic, Wayne doesn’t spray his flowers with pesticides. “So far, I don’t have to deal with bugs or moths [that feast on sunflowers],” like those found in the northern areas of the country, he says. There are more than 70 sunflower varieties, but only three types are used in oil production, including: High Oleic, Linoleic, or Mid-Oleic. Wayne grows NuSun, a mid-oleic variety, because, he says, the seeds have an excellent balance of “essential unsaturated fat.” According to the National Sunflower Association, the oil combines monounsaturated and polyunsaturated fats with low saturated fat levels, and it supplies more Vitamin E than any other vegetable oil. It takes a huge amount of sunflower seeds to create each bottle of oil. The oil is produced in Scott, and even the bottles are labeled in-house. After harvesting the sunflowers, Wayne cold presses the seeds into oil, selling his products, Virgin Sunflower Oil and Rejuvenate Bath & Body Oil, through local venues and online. 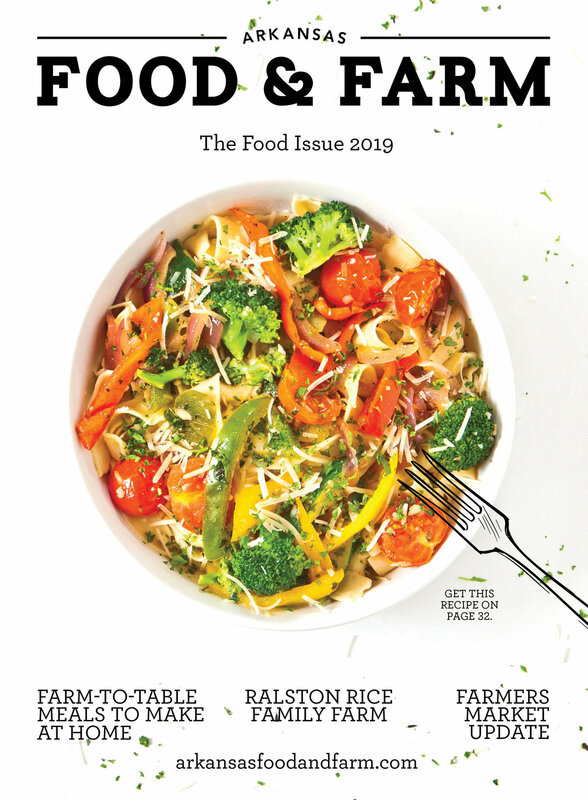 Like others, Wayne hopes the local food scene is expanding beyond vine-ripened tomatoes to using Arkansas grown foods to produce second-generation products like Geek Eats’ hummus or his oils. At this point, Wayne admits, “It’s a niche market,” but he hopes it will grow. Wayne has storage room for 10,000 bushels of seeds. His processing operation is compact with the entire setup—from separating the seed from the shell, extracting the oil, filtering the liquid through a cold press to bottling and labeling—done in a 4,000 square foot facility. There’s also room for his office. 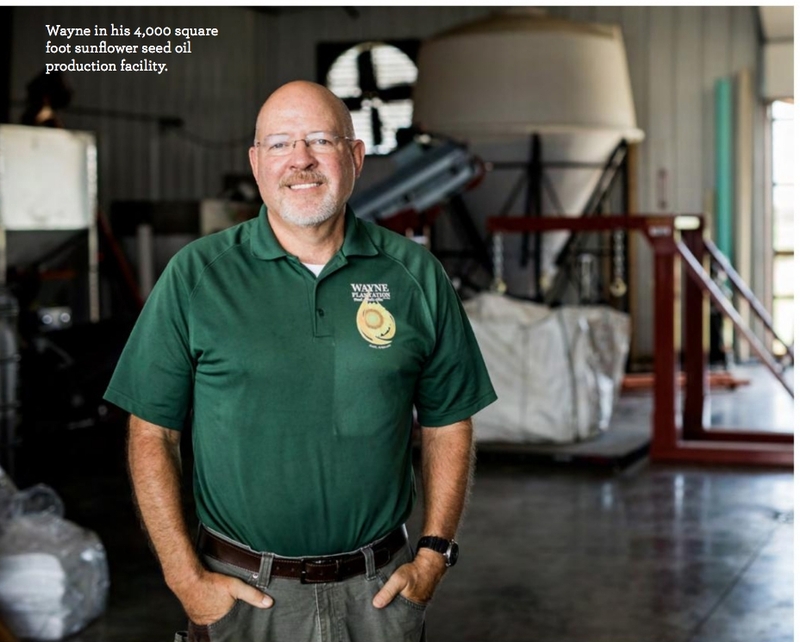 Unlike some sunflower oils that are processed with heat, Wayne prefers the cold-press method—nearly identical to cold-pressed coffee—because it retains its nutritional value, he says. Production runs at about a gallon-and-a-half per hour and is done on-demand, that way the cooking or body oil is guaranteed fresh. He supplies a number of Central Arkansas restaurants and stores, including The Green Corner Store and Drug Emporium, both in Little Rock, and Barnhill Orchards Market in Lonoke. “I have a good internet following and loyal customers from as far away as New York,” he adds. Wayne says he infuses sunflower oil with herbs like rosemary, basil and thyme. The infused oils, he says, also make a great chicken marinade, and Wayne suggests people try it in pesto for a lighter taste. 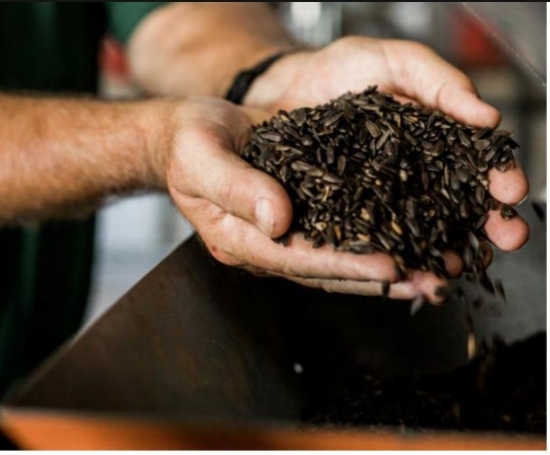 Wayne often refers to his oil as a “bio-fuel,” and in addition to a food-grade product, the darker, leftover oil is used to run his “older, fuel injection diesel” farm equipment. The solid material that is extruded is turned into dog treats and animal feed. “Nothing is wasted,” he explains. Wayne is actually James Wayne IV and grew up across the road from his sunflower fields. Four Wayne family generations have farmed this land since 1889. Blend until creamy and refrigerate.